You know how in basically every television series that you’ve ever seen that the characters are never seen excusing themselves from dinner to go “use the facilities?” Never prior to heading to an away mission does Picard let his team know that they better use the sonic scrubber for the down below… the Cosby clan never had to complain that in a house filled with kids and spouses that there weren’t enough bathrooms to use… the X-Men never borrowed the lavatory pass at Xavier’s School for Gifted Children. What sort of superpowers did the aliens of Star Trek, the mutants of the Marvel Universe, or a close-knit family in Brooklyn Heights have that they never once in dozens of seasons needed to go to the bathroom? 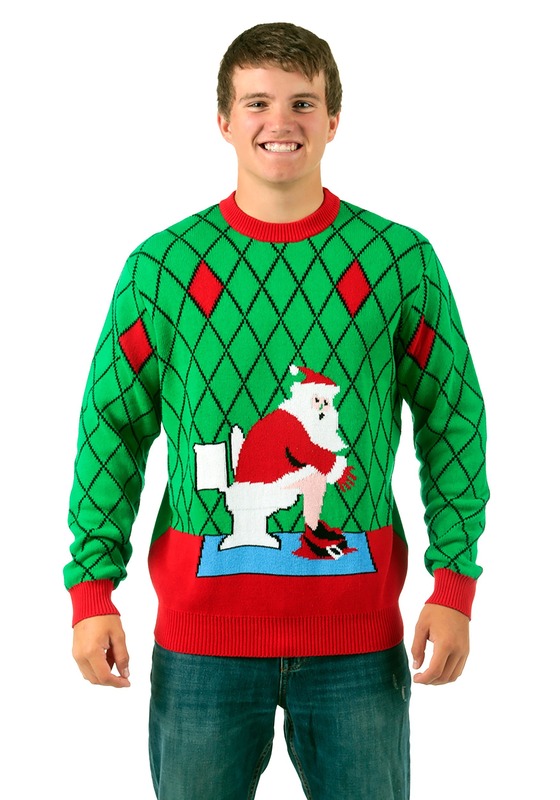 If that kind of break from reality drove you crazy, than you’ll be incredibly comforted by this Toilet Santa Ugly Christmas Sweater which, for once and for all, admits that even the Big Guy up North doesn’t have the magical skills needed to disrupt his own basic biology. All those cookies certainly do the job on the guy. So, you can be comforted by both knowledge and this acrylic knit sweater… while you make everyone else incredibly uncomfortable, anyway.